It’s the end of the school year! Well, almost anyway. It’s that time of the year when things start to wind down and loosen up, but you still want the children to actually learn something. So here are some great resources, ideas and activities to celebrate the school year, recap everything you’ve learned and send the kids off into the summer holidays in style. Getting children to reflect on everything they’ve learned and achieved may be an obvious starting point, but that doesn’t mean you can’t save time by finding a pre-written list of questions to start yourself off. Like this one. And you can also download them as task cards if you prefer. There are 20 questions on this list which you’ll find here. If you’re looking for a free, printable scrapbook then this nine-page PDF should do the job nicely. It’s free, with no sign-up required, and you can find it here. This activity sheet helps Y6 children think about their current school, and the new one that awaits them in six weeks, from similarities and differences between the two to things they’ll remember about primary and what they have achieved, and things they would like to know about their new school, and what they are looking forward to. For other year groups these transition book templates can be used with a range of structures to match the age / ability of your class. For the Year 6 activity sheets click here, or for the transition books here. And if you are looking specifically for resources, videos, ideas and activities for those who will be moving on to secondary school this summer, we’ve also compiled a list post of all these. This end-of-year activity makes a great gift for kids to take away. Print out lists of everyone’s name in the class (yours included) and get everyone to fill the sheet out using one positive word to describe each person. Then input those answers into a word cloud generator and print out each child’s personalised page of positive traits. No, we’re not suggesting you spend the last day handing the “teaching” over to some DVDs, this American resource has some great educational activities to go along with a fun day of turning the classroom into a cinema (only without the extortionate prices). If you’re just after a simple list of ideas to try out then this post features 12 effective lessons and activities to teach at the end of the school year. Give it a look at Teachhub, here. 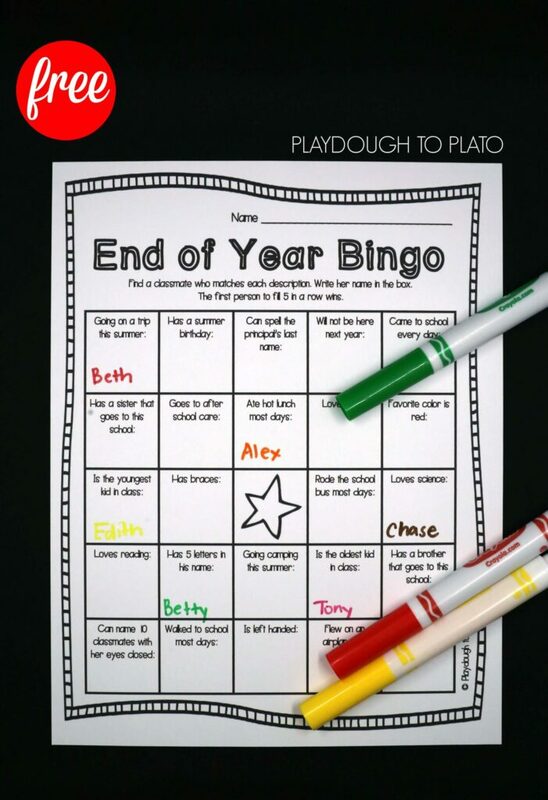 This free printable game will have kids having fun out of their seats trying to get the information from their classmates to fill in their bingo card. The rules are simple: children will find a classmate matching each description and write his/her name in the box. 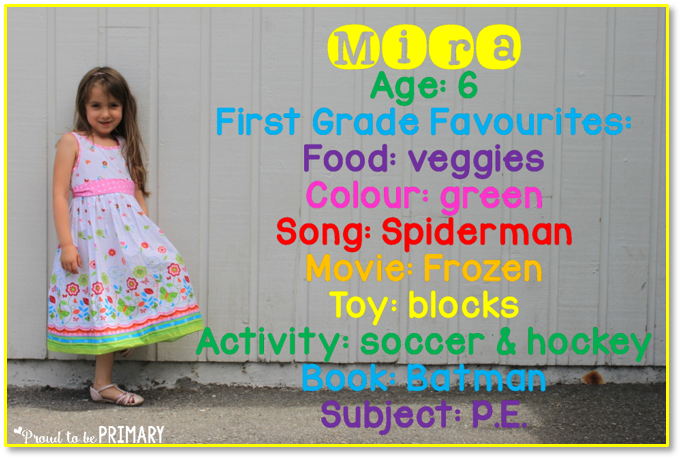 Kids can go ahead and fill in blanks they already know or they can wander around asking friends if they fit one of the characteristics. The first person to fill 5 in a row wins. It’s the end of the year, so the weather is hopefully nice and suitable for this activity. First, you get children to fill out this survey of their favourite things (which you can print off here). Then you can all go outside and take a nice photograph of each of the children, before putting their survey answers over the pic on a computer. Get all the tips and instructions here. Hands-on, fun art activities will always go down a treat at the end of a school year, and this list has a nice selection for you to choose from. Click here to see this list of arty ideas. Or, math ideas (it’s an American blog). There are some fun learning activities for inside the classroom and out here, from STEM challenges, a paper aeroplane contest and parachute testing (not real ones, thankfully) to a pirate escape test and making a fractions chart. Give them all a look here.